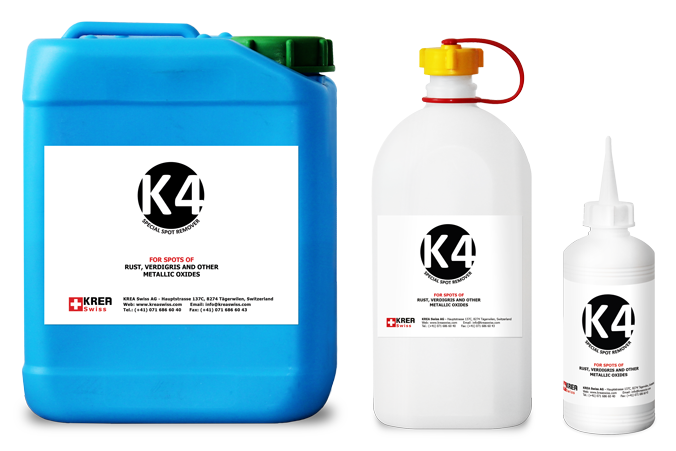 The K4 is the spot remover for staining metal spots like rust, verdigris and other metallic oxides. 2. Let the chemical action work on for 20 seconds or so then rinse out. 3. Important: To avoid rings, ensure to flush the solvent out thoroughly with SOFTsolvent or the SOFTsoap. Avoid contact with skin, eyes and stomach as the product is classified as an irritant. K4 may damage acetate fabrics! Prior to spotting, we recommend to try the products on the seam.